I've actually started dreaming about scarves after a week sourcing, photographing, counting and posting them. But on the upside I get to feature one each day - I'm calling it 'The Scarf I Stole Today'! Starting with today's one - which literally just arrived in the shop. The Rebellion Aztec in Orange. It's the orange version of the blue/coral one that has sold out a couple of times this week and I'm loving it for brightening up the misery of 7 degrees in May (almost June). Wearing with the same outfit I wore on this post 2 months ago. Striped top from Tesco, skinny jeans from French Connection, navy boots from M&S and my endlessly useful Target Dry Emily parka. Such a pain to be back into wintery clothes again. I had to hunt down the ankle boots this morning from the top of the wardrobe. 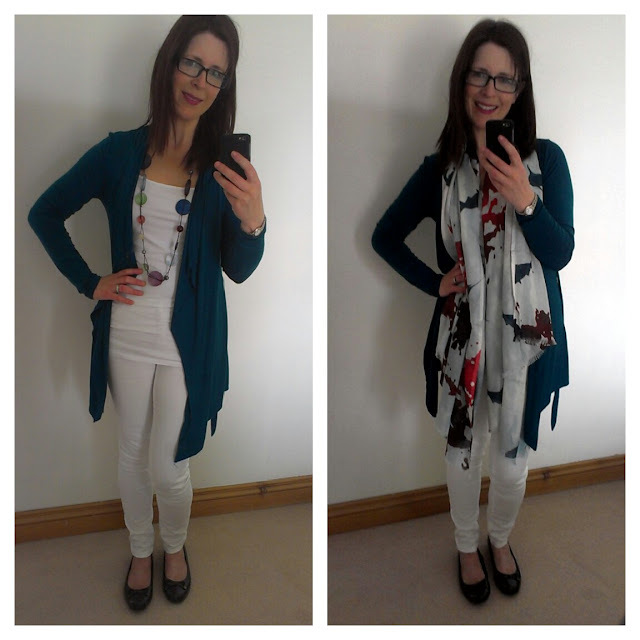 Yesterday was a bit nicer with sunshine so I wore my H&M white jeans with another of my scarf shop favourites, the Teal Escape Scarf. Scarf - School Gate Scarves! I love how it transforms a plain outfit of jeans, jersey cardigan and necklace into something way more stylish. And I'm so pleased to have another excuse to wear this teal colour as it's not one I wear enough. As I type, I'm wearing a hoody over my outfit from earlier and furry boots. Le sigh. Thank goodness for wine and Kettle crisps! Up to 90% off - wow. That's dangerous. 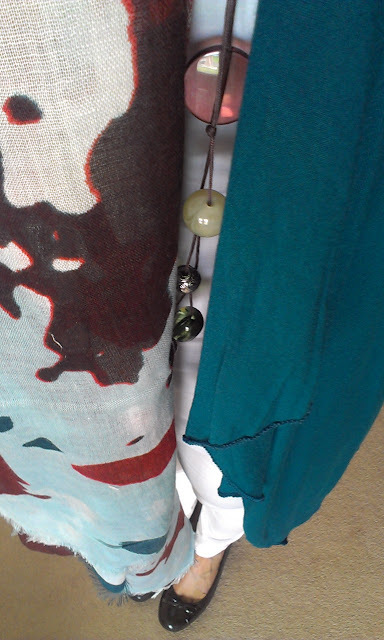 And the Teal Escape scarf looks fab - I like the predominantly white background - makes it so spring like. Just beautiful Avril! I would love to see a 90% sale, my husband not so much. Hello Avril from a cold + chilly + windy Warwickshire! 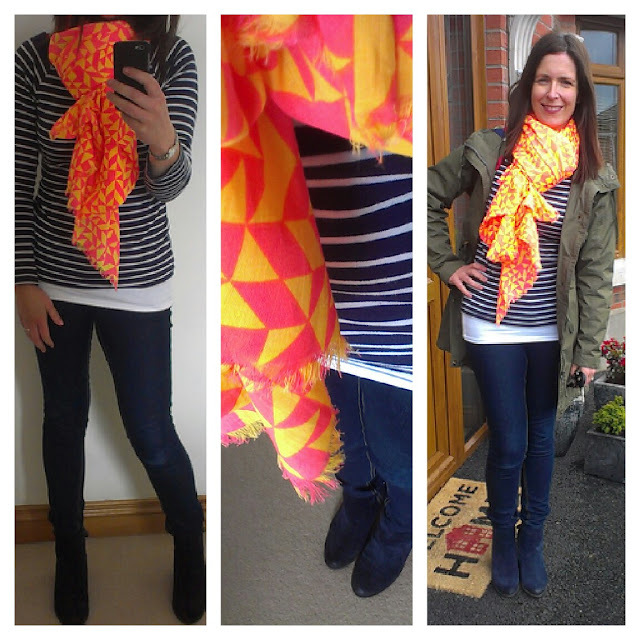 Both my daughter + I love scarves - they can so brighten up a dull outfit! My daughter bought one the other weekend when we popped down to the Cotswolds for the day and then lo and behold, we saw the very same ones up in Edinburgh last weekend! Must u keep wearing those M&S boots Avril- I still need them!! I've said it before and ill say it again- u are the queen of scarves! I'm thinking of going for the blue lightning one to fit in my my blue obsession of late, really want that taupe/neon one but I have a very similar one.